In our most colourful issue yet, we step into the life and work of architect Francis Kéré, known in equal measure for his lighthearted and innovative architecture, his remarkable background, and his infectious sense of optimism. And his path is an extraordinary one: beginning in Gando, a small village in Burkina Faso, and moving all the way to West Berlin in the 1980s, where Kéré would end up studying architecture. His graduation project was the school Gando never had – built in 2001 with the help of the people it was designed for, the village community. It was also the starting point for his own practice that celebrates architecture as a fundamentally social act. 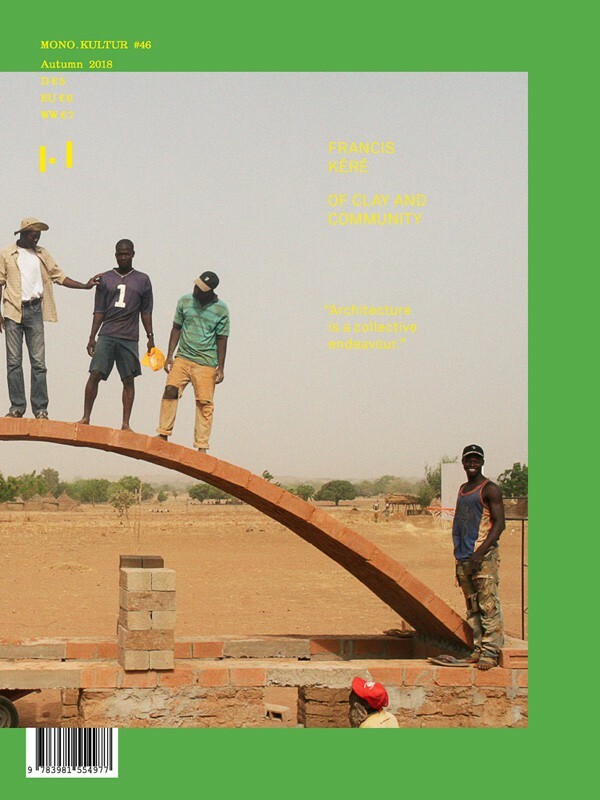 Since then, Kéré has completed numerous projects both in Africa and beyond, including schools, medical centres, cultural institutions, and temporary installations, such as the renowned annual Serpentine Pavilion in 2017. Frequently relying on local materials and infrastructure, his work is marked by a profound simplicity and refreshing lightness, meeting technical problems with surprising and seemingly effortless solutions. It reflects his attitude that architecture should, in its most primary function, seek to improve the lives of the people who inhabit it. With mono.kultur, Francis Kéré talked about his long trajectory from a remote village in Africa to Berlin, his steadfast belief in optimism, and what makes a tree a perfect piece of architecture. Designwise, we followed Kéré’s principle to work with what is at hand, sourcing papers from dead stock at our printers’, essentially using an assortment of leftovers. And colour, of course, with the issue based on the national colours of Burkina Faso, paying tribute to the idea of culture as a shared ground to build upon.